He Jiankui gene-edited babies Gets Grilled by ‘Horrified’ Colleagues. He took the stage just before 1 p.m. local time and began his talk with an apology. “First, I must apologize,” He told the audience. The results of the study leaked unexpectedly, he said, taking away the opportunity for the data to be presented in a scientific venue. “The study has been submitted to a scientific journal for review,” he added. He also thanked his university, the Southern University of Science and Technology in China, but noted that they were “unaware of the study’s conduct.” On Nov. 26, the University released a statement saying that He had been on unpaid leave since February, and that they were “deeply shocked” by the news of the research. 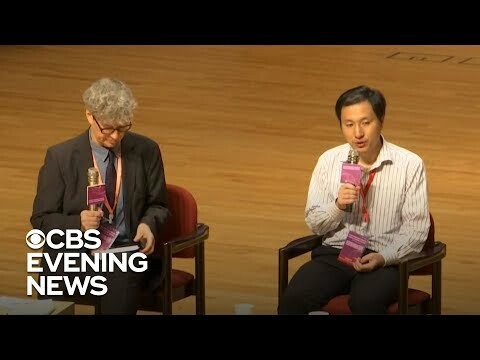 In his talk, which detailed his research on editing a gene called CCR5 in human embryos, He said that the parents were given the option to exit the trial without implanting the gene-edited embryos, or to use non-edited embryos instead. However, he said, the couple opted for the gene-edited embryos. He also addressed concerns about “off-target” editing. “Off-target” editing happens when the molecular editing tools target and alter the wrong spot in the genome, which could have serious consequences. The team did identify one potential off-target edit in the embryos, He said. However, he claimed that this edit was in an “intergenic” region of the genome — a stretch of DNA that doesn’t code for any proteins. He also said that the parents were informed of the potential risks of the off-target edit. After the babies were born, the scientists tested the infants’ DNA to confirm the intended gene-editing occurred. He also claimed that the off-target edit was not seen in the babies’ DNA after birth, suggesting it may have been an error that occurred when analyzing the embryonic DNA. He concluded his talk by mentioning plans to monitor the twins’ health for the next 18 years. Following the talk, He faced a barrage of angry questions from the talk’s moderator as well as from scientists in the audience. He ended by saying that he would’ve done the same gene-editing to a baby of his own.